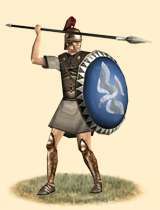 The classic Greek hoplite still uses the old Argive shield, spear, short sword and linothorax. Although surpassed by the times they can still be usefull in any battle line. Even though the Makedonian Phalangitai have become the dominant infantry type among the Hellenic powers, the Hoplitai of old who fight in much the same manner as the Hellenes did at Thermopylai, Marathon and Plataiai, are still around defending their poleis. Each hoplites is equipped with linen or leather armor, an aspis shield, greaves, the attic style helmet and of course, his spear. The equipment might have changed since the battles of centuries past, but their tactics have not. The Hoplitai still fight in the phalanx formation, often eight man deep whose purpose is to advance forward upon the enemy line, tie them and to whittle them down through attrition. Historically, the hoplites is one of the most famous types of soldiers that has ever existed. The Hellenic military ethos and culture from the 8th century until the Roman hegemony created a highly skilled heavy infantryman. This combined with the phalanx formation, proved to be key factors in winning over the numerically larger Persian and barbarian armies of the day. The Hoplitai were mostly drawn from the well-to-do citizens of a polis, who often had a stake in the outcome of the battle or war to come, and who were bound to eachother by a patriotic feeling to their home city, creating a body of citizen-warriors whose motivation was unlike that of any levy, mercenary or other professional soldiers. The hoplites of the Hellenic city states continued to be the dominant infantry type on the battlefield for almost two centuries after the Persian Wars, but the appearance of the Peltastai made them more vulnerable than before and highlighted the shortcomings of the phalanx. Then the rise of Makedonia in the north and its Phalangitai, caused the decline of the "classical" hoplites being fielded in large numbers. However, variants of the hoplites were succesfully adapted by various Hellenic powers, such as the Ekdromoi and Thorakitai Hoplitai. And even after the wars of Alexandros and those of his successors, some poleis and smaller communities still fielded contingents of Hoplitai, who were trained and fought in the same fashion as the Hoplitai of old.